Summer the hot and humid season of Bengal though most dreaded and unwanted still has a certain charm. Apart from all the mangoes and the Indian berries this is the perfect time to enjoy chilled drinks after a hard day of work. 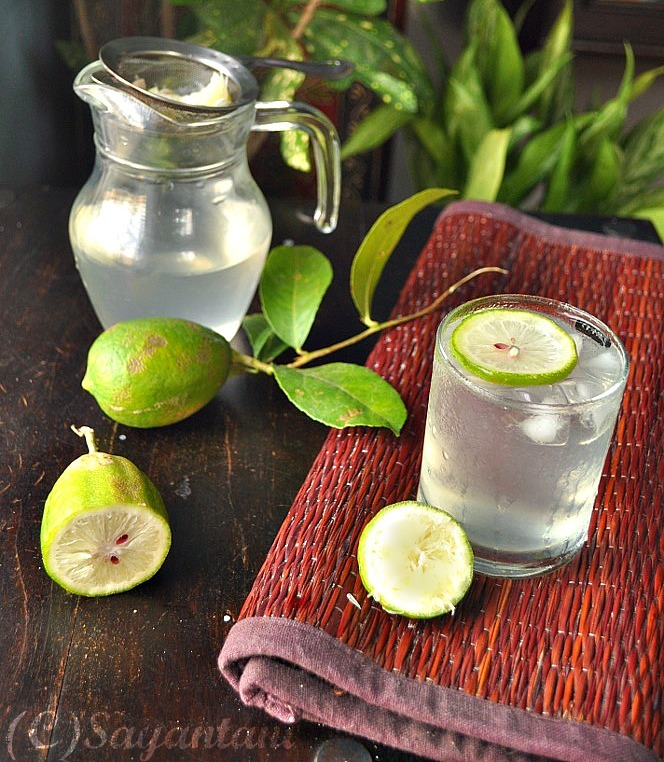 And trust me all those summer quenchers never taste so soothing if the heat is not unbearable. Think of those scorching afternoons, coming back from school all thirsty, tired and sweaty and then the sigh of relief in Mom’s magic potion. That chilled glass of homemade lemonade. The simplest of dink one can think of only with sugar, water and lemon but still there is something magical about it. It has this amazing power to bring solace in sweltering heat,no cola no packed juice can compete with that. 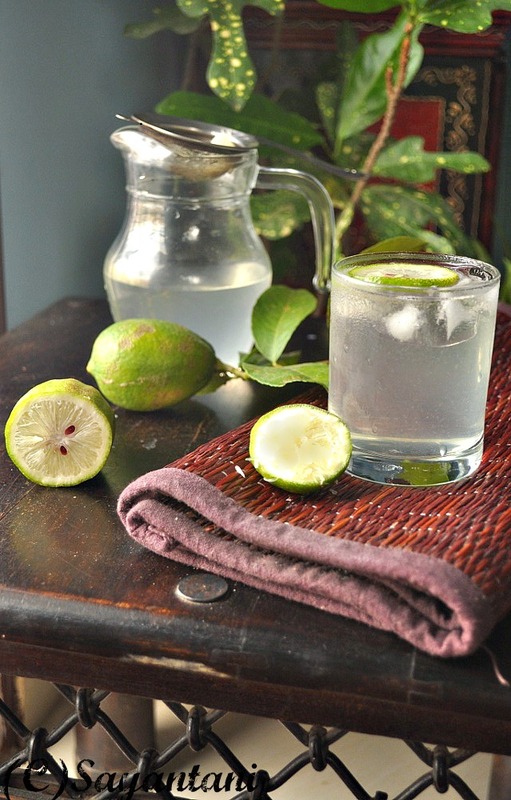 Lebu’r Sharbot, nimbu pani, shikanji or lemonade is the name of a simple summer thirst quencher popular all over the world. 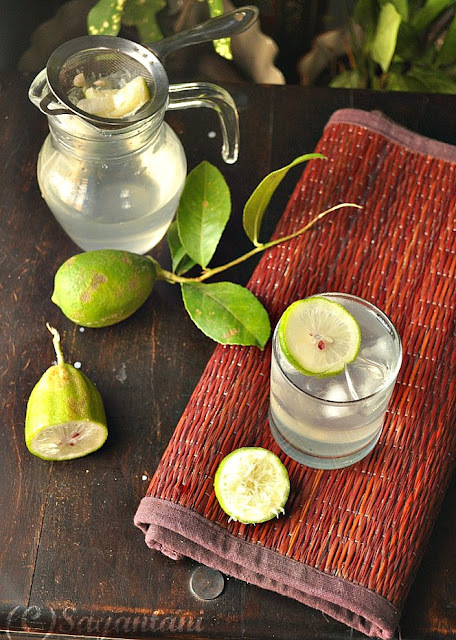 From poor farmer staying in a remote Bengali village to someone living in a posh multistory, all rely on this simple drink to sooth their tired soul. And this most probably is the oldest drink that the mothers have been making for their families. 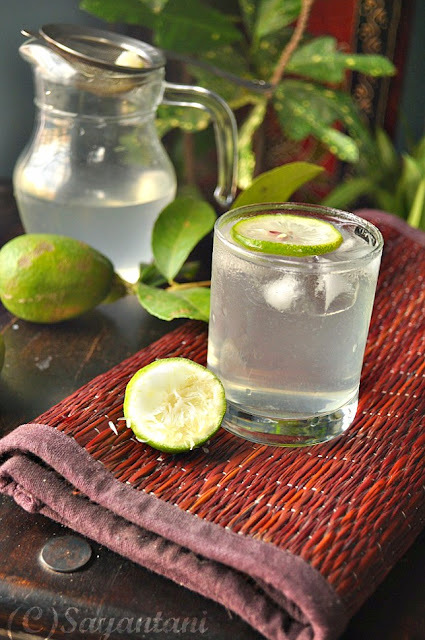 I can remember barodida (My grandmother’s mother) making this drink by pulling the two glasses apart and pouring the water from one glass to another to melt the sugar. Mixing freshly picked lemon juice from her backyard, straining the sharbot in a old steel strainer and then serving the drink to my father, their beloved son in law. In my house we still have a few embroidered tray clothes that the ladies made to serve such drinks to respected guests. Last week we went to New Market to pick a few things. After walking in the blistering sun for sometime we badly needed something to soothe our dry, parched throat and then my husband offered to buy some nimbu pani from a roadside vendor. For various reason I never have tried such drinks outside but that day the sweltering heat made me give in. and am glad that I agreed as that’s the most soul soothing drink I have ever had. It was chilled to perfection, sweet enough to relax the body with little kick of lemon at the end. Though am not sure if am going to try this again in near future but I definitely will remember that experience all my life. Yes that’s the power of this simple drink. I donot know if whatever I am going to share today would qualify as a recipe but this post is a tribute to our simple and uncomplicated childhood. I have grown up with this drink and have always found it when we came back from school. Maa used to make this with the bounty of the gandhoraj lebu from the garden of our rented house. The huge old lemon tree by the side of our house bore unlimited fruits during this season. This lemon is known as the king of lemons in Bengal and has a delicate, one of its kind aroma. And the fragrance makes for the little juice that it contains. Lebu’r sharbot is always made fresh in our household, which I also like to follow. Maa always soaked a small piece of gandho lebu wedge in the sharbot to concentrate the citrus scent. I do the same when I make it for my sonny boy for his after school refreshment now. That’s how memories are relived and traditions are kept alive. To make a glass of this refreshing drink mix 3 tbsp (increase or decrease depending on your preference) sugar in a tall glass of water. Stir with a spoon to dissolve the sugar. Cut a big wedge of gandhoraj lebu and squeeze the juice in the sugar water (approx. 1 tsp). Squeeze real hard as the gandho lebu has a very thick and hard skin. Soak that squeezed piece in the sharbot for a few minutes. Strain and serve with ice cubes. Dish name starts with L at Learning to cook. Mom's Recipe @ Srav's culinary concepts. lemonade recipe. 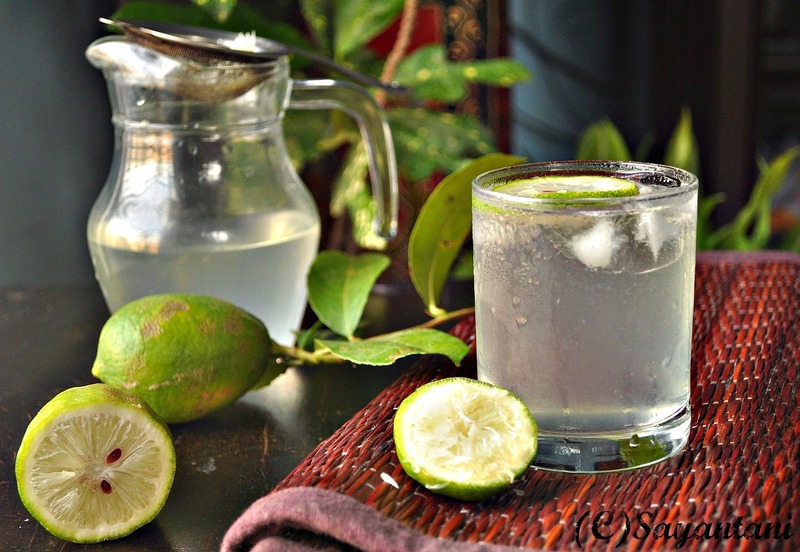 limeade recipe, indian limeade, shikanji, sikanji, sikanjee recipe, nimbu pani, nimbupani, lebur jol, lebur sharbot recipe, lemon drink recipe, summer lemonade, easy lemonade recipe, how to make lebur sharbot, sherbet recipe, serbet recipe, refreshing beverage for summer, how to make lemonade, easiest lime drink, benagli sorbot recipe, sarbot, sharbat, kagji lebur sharbot recipe, gandho lebu, gandharaj lebu. Awesome picture. can't wait to prepare and drink. Simply love it. simply refreshing:)On my trip to kedarnathI saw this road side vendor sitting by the roadside selling some kind of green drink from a terracotta handi.Curious I asked what it is and he revealed it to be our nimbu pani . "...our simple and uncomplicated childhood"
I am so craving that right now. Beautiful clicks, love the idea of adding a lime wedge to the glass..
jole ektu nun o bhalo lage..both black and regular salt. desher dike oneke jaber bhetor pati lebu chipe khay..not always turns good unless the water is sweet..didir sosurbari te dekhi jole sukno lebu pata bhijiye rakhe sorbot korar age. glad you are making such memories for sonny boy too! Beautiful post Sayantani, and lovely pictures..it just captures the mood of your post...beautiful !! Sayantani! love the pictures and the childhood memories you have shared! True, lemonade brings back a lot of fond memories! I would slurp it up on a real suuny day, but alas the weahter here we sill having is so horrible. Love ht epic. All your images are so refreshing and your post is well written too. Liked it. Love your intro and pics. You are right this is one of the oldest drinks we have had. Wow!! so refreshing.. The images make me want to have a limbu sharbat right away..
What can be more refreshing and cooling than a glass of ice cold lemonade. Beutifully presented. thanks. I have bought Gondhoraj from Chittaranjan Park in Delhi but didn't know how to get the wonderful smell on to the dish. This soaking for a few minutes is great.